Or for a blank version click on the image below or go HERE. As always, if you make something yourself please send it in so we can share it with the other Skull-A-Day fans! Displayed with the proud artist. You know I have a soft spot for up-cycling found objects into art, but this is truly a masterpiece. It is absolutely amazing what you were able to accomplish with the materials you acquired. I had a good time going down your list and trying to find where they were in the art. I wonder if there are more to be made in the future. I would love to see a series of them that show off the uniqueness of what you were able to find that time around. Thank you for submitting such an incredible piece of work. It is never too early to start thinking about the winter holiday season. Here is a little tool to help you keep track. Our first contributor Jen wrote: “I made a batch of paper mache skulls for our holiday tree. This is one of my favorites. We'll see if my husband ever lets me decorate the tree by myself again. ” One can find more pictures of decorations here. Next up is James Robinson at Fire Cat Studios who told us: “This was the ‘angel’ on our x-mas tree. Made from a white glove, black fabric, and part of a clothes hanger. 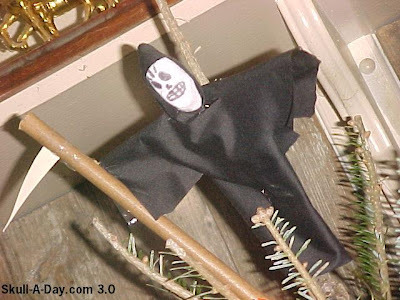 I really like the idea of a momento mori themed holiday tree especially when those decorations are handmade. Thank you both for submitting your work and Happy Skullidays to one and all. 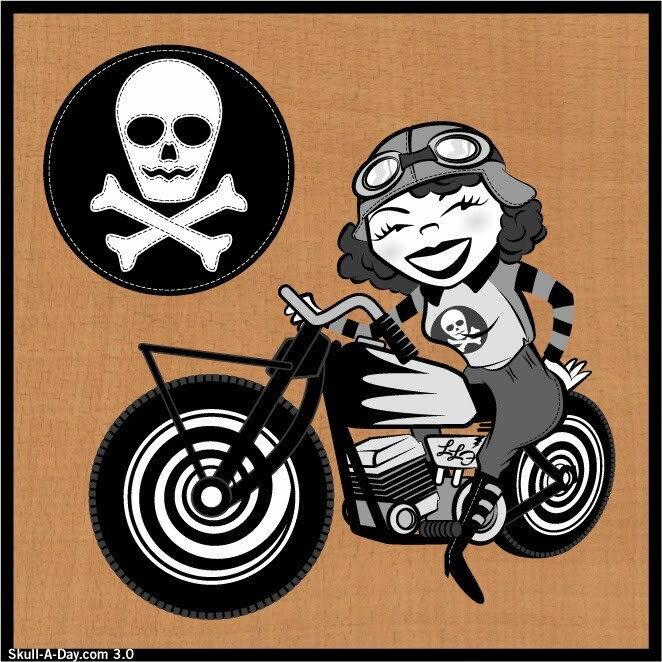 And hey if you want some of your own Iron Fist gear, be sure to check out their site and use coupon code SKULLADAY to get 15% OFF your order through May 31! 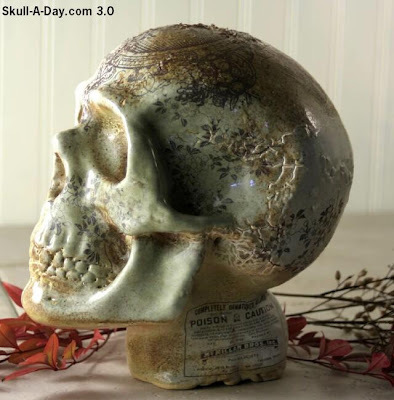 ShellHawk in Folsom, CA said: “I'm a beginner potter who is into Halloween. 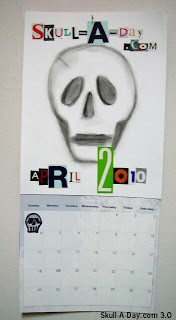 I made this skull to give myself a break from making jack-o-lantern pots, and I like the way he turned out. I know visions of Halloween immediately come to mind in these two examples, but the act of containing a flammable material in a non-flammable container is universal for any time of the year. I really like decorative lanterns because I am mesmerized by the patterns of light and shadow they cast, and imagining the patterns these two pieces cast has removed them from a holiday decoration and made them into works of art for me. Thank you both for sharing your work with us. As the temperatures get warmer everyday I am happy to reintroduce some of my favorite shoes to the great weather. 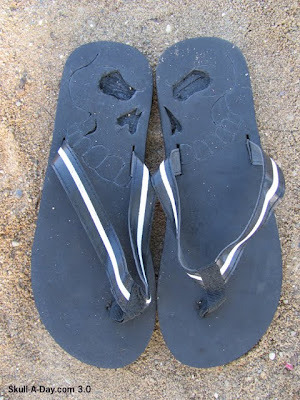 I call these flip flops because of the regional dialect where I grew up. I've also heard them referred to as sandals or thongs(for some reason). Maybe they call them something else where you live? Let us know if you have any kind of crazy or unusual names for this style of shoe. 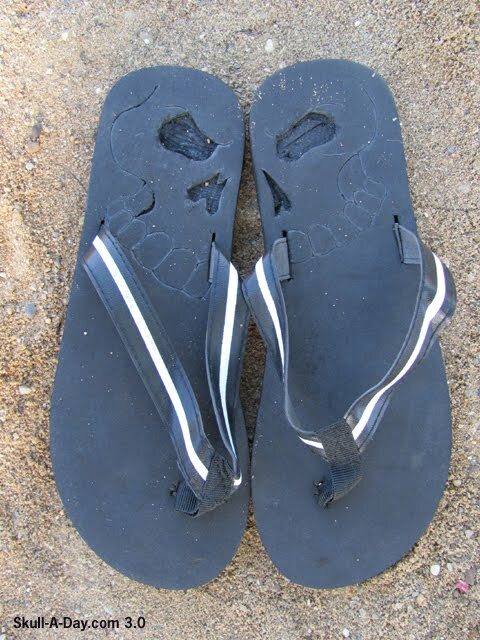 No matter where you are I hope you all get to enjoy flip flop weather at some point in the year. You really know how to brighten someone’s day! This is a wonderful piece, it is a shame you need to burn it. I like the simple nature of the design, with the stark use of color/white to offset the large dark area. It might have taken you longer than you expected, but the results are worth the effort. Thank you for submitting your work, and please keep us in mind when you do one for this year. 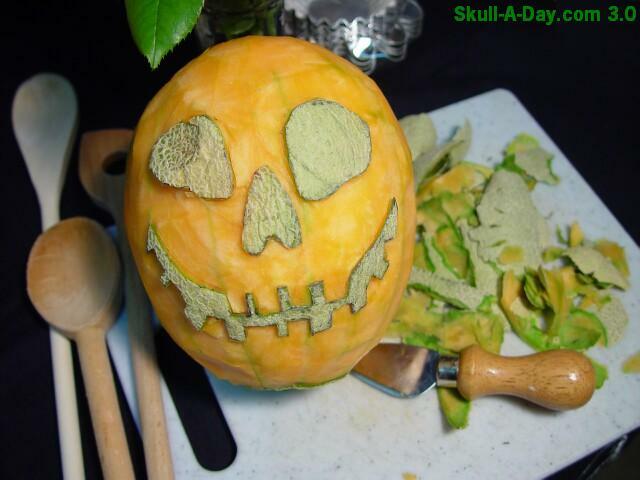 This week’s offering is a Cantaloupe. “Already Married” 6" x 5" Pealed Cantaloupe. While it is welcomed and amazing that traditional summer fruits are available all year round, it concerns me about the sustainability of this practice. I heard a report this week on the economic impact of the volcanic eruption in Iceland, and the millions of dollars of food that rotted in Africa because they were unable to deliver the produce to Europe by air. My thoughts this week are with the ever shrinking world and the impact of events on it’s populations. My thoughts also turn to the chemicals that allow for greater crop yields through pesticides and fertilizers, the social and economic impact on the local labor employed to tend and harvest those crops, and the natural resources used to get this product to market thousands of miles away from its source. A frequent contributor here President Wishnack sent us this: “I just picked up a new job in the Financial District and my office has a nice view of the Bay Bridge. It also has a nice view of this skull skyscraper! 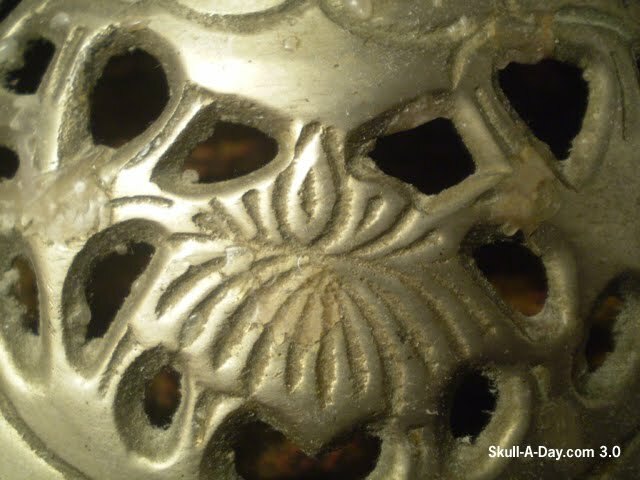 This is about 50% real and 50% edited to look like a skull-- but it was close enough that I saw a potential skull before taking it to Photoshop. Inspiration comes in many different ways, seeing something in an alternative composition is just one way in which our minds help us to comprehend the world we experience. Sometimes all it takes is a a little push with our mind to make great things happen. Thank you for submitting your work, and keep pushing greatness. 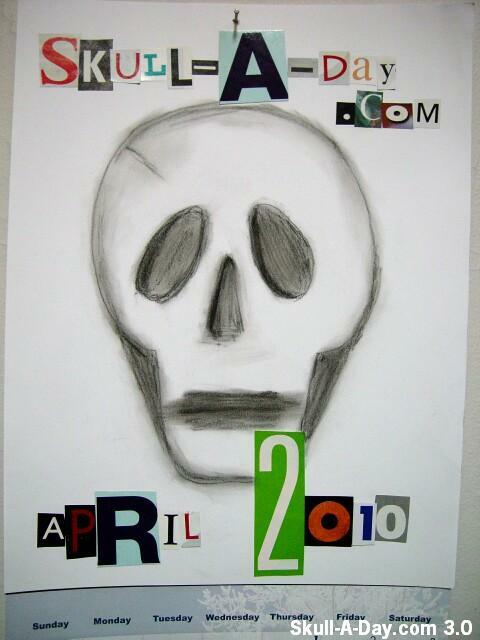 This week we turn to the bathroom for our collection of simulacra. 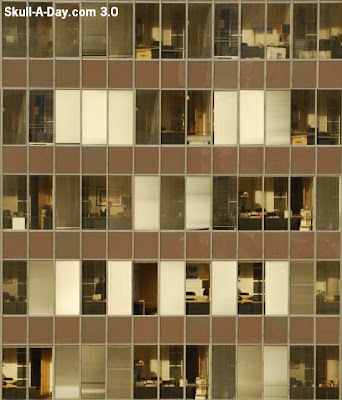 This is another interesting collection of simulacra assembled by our team of readers. Thank you all for taking the time to submit your finds to us. Mike Christopher(Hare Krishna Zombie from “Dawn of the Dead”) captured this skull through the windshield of his 1984 SAAB 900T at Florida in January 2010. 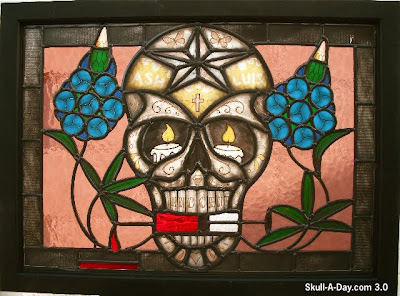 It was great to see this collection of some of the different ways in which skulls that we experience everyday are capture in an artistic way by our readers. Looking at all these pieces I am reminded of how truly unique the moment of their capture was since the environmental factors that were present at the time can never be duplicated. Thank you all for submitting your work for us to share. Congratulations to ShellHawk ("You Call This A Cemetery?") and Brew ("Never Saw It Coming") who were the randomly selected winners of the Iron Fist giveaway contest! Thanks again to everyone for participating. I can't tell you how much fun it is to read all of your creative submissions during these contests, you're such a talented bunch! 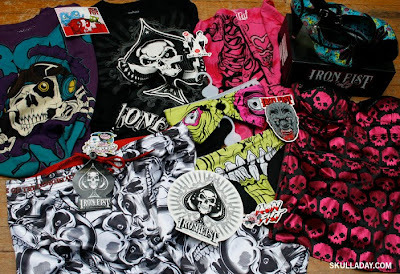 And of course even if you didn't win you can can still get some nifty skull gear at Iron Fist! 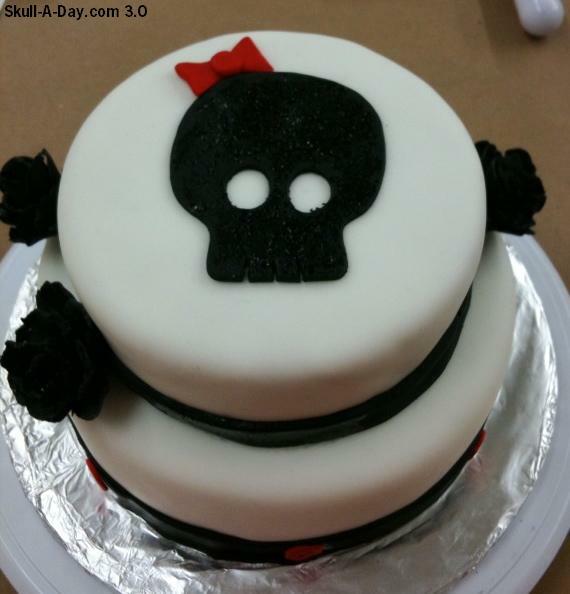 Plus if you use coupon code SKULLADAY you can 15% OFF your order through May 31! I cook a lot with soy sauce so it makes sense that it would eventually end up as part of the project. I also use chopsticks a lot so they were my go to tool for arranging things, though obviously it made perfect sense to use them on this one. 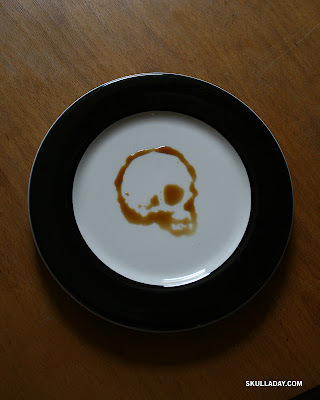 This skull was actually trickier than it seemed, since the plate wasn't perfectly flat and if I moved away for a moment to set the camera up the image would change and so I had to remake it a few times before finally getting the shot I wanted. It looks like I found someone else who may be at the reunion this summer. What an impressive vehicle you have constructed. It is such an honor to hear when a site that I assist with inspires someone to do something creative. I like the paint job very much, it was interesting to see your use of different styles of skulls in the motif. Thank you for sending us your work and best of luck racing (if you run that circuit). 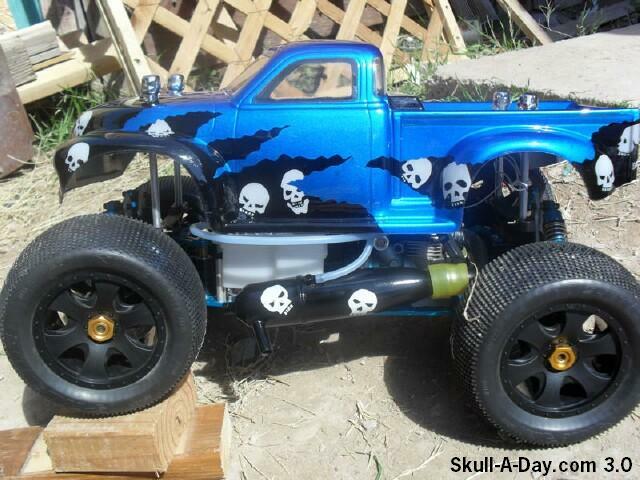 I hear the odds are 2:5 that you will have the coolest truck there. The Summerworks series starts in June and more details about it will be on their site soon! 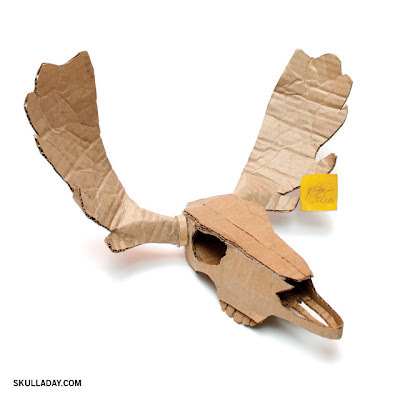 Speaking of cardboard be sure to check out the (non-skully) cardboard moose made by my friends at Cardboard Safari (who also make the cardboard skull & wreath I designed!). Check out more of Dan's awesome work on SKULLUXE. 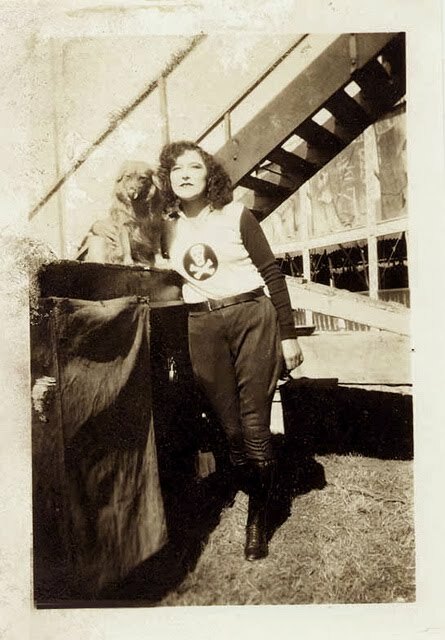 And find out more about Lillian La France on The Selvedge Yard. First off are you going to the family reunion this summer? 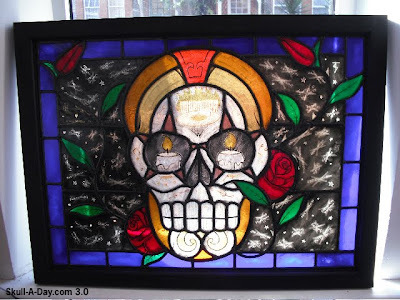 Your dedication to making and displaying art is something we need to be in awe of. 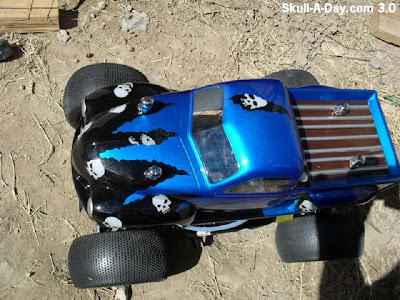 Maybe you saw the Skullmaster’s car hood based on 282 and maybe it was an inspiration for you. 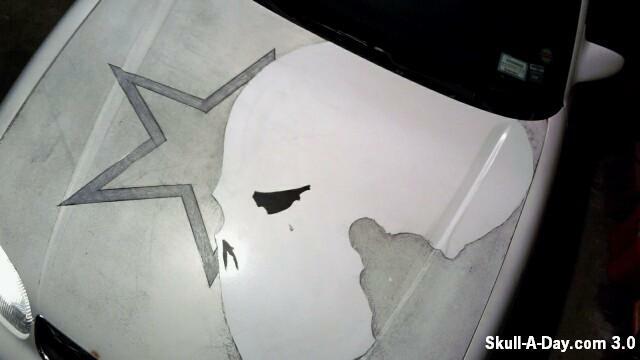 Although we have showed simulacra and temporary works, I believe this is the first permanent car hood we have shown in use at Skull-A-Day. Thank you for submitting your work and please make sure you send us a picture in a couple of months after the design is finished rusting out. My friend's dad hates paying upwards of $5 for a pack of cigarettes so he rolls his own to save money. Plus he enjoys a wider variety of tobacco than what the name brands offer. 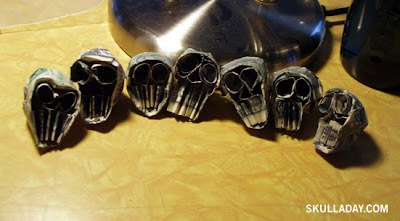 It's still smoking, but I couldn't help but think of a skull when I saw his pack of papers. 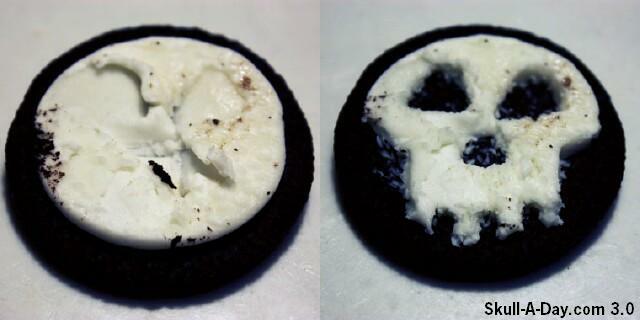 Alas, none of his smoke rings looked like skulls. Shhhh! Today is also a (not so)secret holiday to those who know. That is all. I love the end result and I'm glad a new skull design was created in the process. And even though my work won't end up in an episode of CSI it was fun getting to have a random conversation with some interesting folks I would have probably never met otherwise. The episode of CSI, with their skull bill is scheduled to air on May 26th, so keep an eye out! [UPDATE] Since a few people asked, I got Catherine to describe how they made it and here's what she said: "We took a piece of paper the size & shape of $ and mashed it around a champagne cork. The jaw line sticks out a little more than the top of the head. 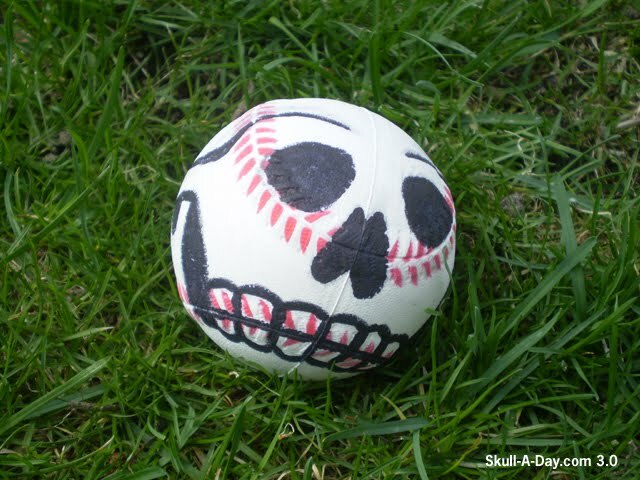 Stuff the skull with crumbled up paper. take a strip of paper about 1/2 " wide and accordian fold the teeth. 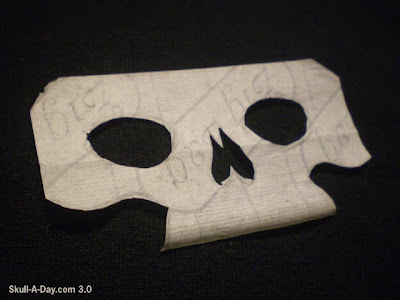 Take another 2 strips of paper and roll them around a pencil to make the eyes. Glue them together and cram them into the skull. 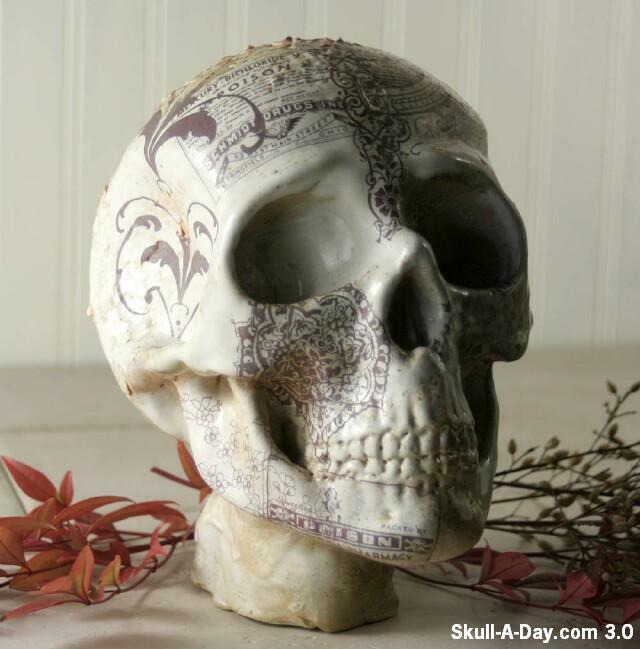 The crumpled up paper in the skull give the other stuff something to stick to. That's it roughly. As the day went on we resorted to my new favorite folding term "pushing & mashing". There is no pattern. Good luck." This week’s offering is vintage China. “Bone China” 9.5" x 9.5" vintage thrift store china plate with painted black embellishments. 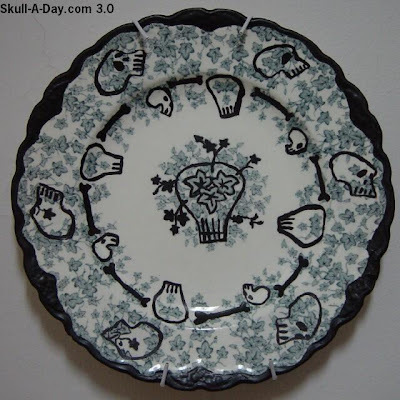 I had this thought of making true “Bone China” not of real bones, but of bones on the china. Not knowing where to go for just one plate, I decided to try my luck at the local thrift shop and there it was, one lonely mismatched chipped plate just waiting to be up-cycled. I really like how the leaves had a way of growing into the design to become eye sockets in various paces. This is truly a moving piece. 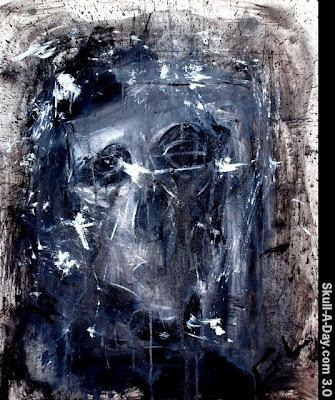 The ghostly skull image emerging from the darkness is eerie, yet at the same time appears friendly almost as if it is about to offer something comforting out of its closed mouth. I found it almost hypnotizing staring at it trying to figure out if that additional face was intentional or just an odd coincidence. Thank you for submitting your work as well as your previously found skull. Some of you might know that I have a twin brother, Pudge, who has made contributions to Skull-A-Day in the past. Today we teamed up as skull hunters to bring you this week's round of simulacrum. 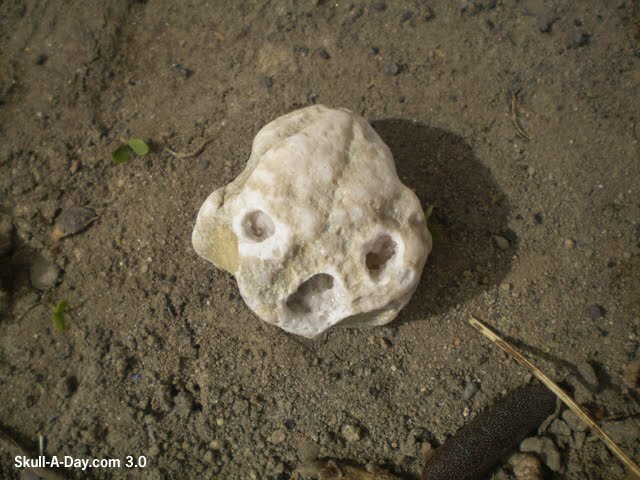 Pudge found this rock that looks like a strange alien skull. Maybe it's a fossil from a prehistoric space traveler? 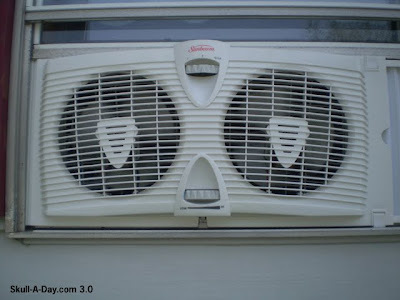 As we ventured about I noticed this window fan that had a cool look to it. Once we returned indoors I was shocked to see a skull that Pudge had hiding right in the house. This was on the base of a candle holder. So as you can see, skull hunters, finding skulls does not have to be a solitary activity. In fact, skull hunting is enjoyed best when it's shared with friends. 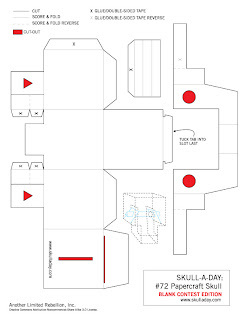 Maybe some of you could even organize skull hunting parties in your local neighborhoods. Just make sure that everyone knows you're not hunting real skulls. We don't need any readers locked up for a silly misunderstanding. 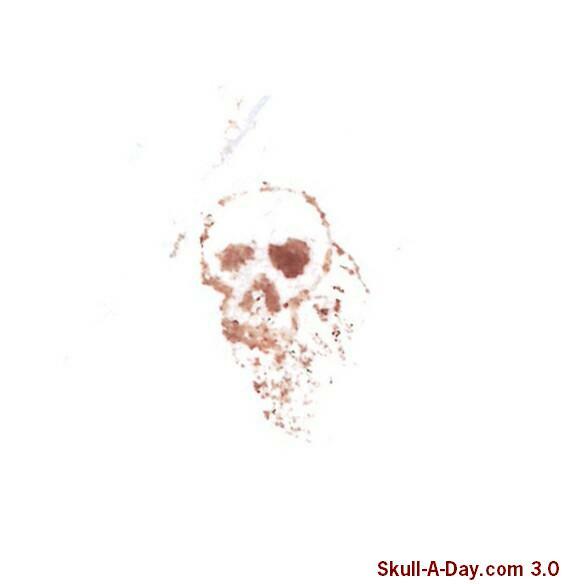 Just let them know you're on a hunt for skulls to submit to Skull-A-Day. Okay, I know I've been going a little big on the posts for Saturdays, but it's so hard not to show off the great work of our submitters. With great stuff to display, like these stained glass skulls from Tom Spencer of West London, I have no choice but to make your Saturday a little more skull filled. Thanks for sharing your terrific talents, Tom. 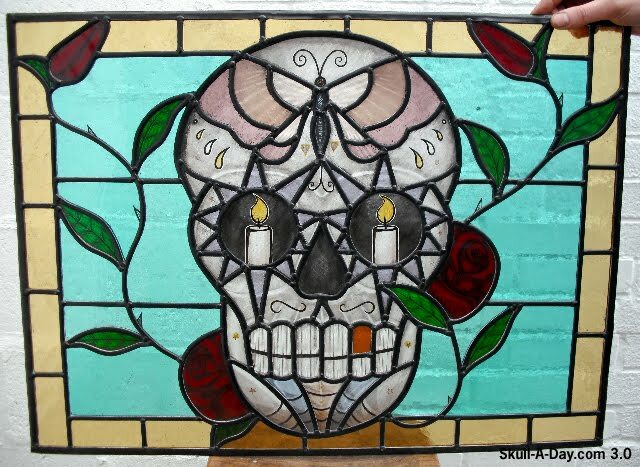 I'm a big fan of tattoos and stained glass and your works at your Tattoo Glass site really inspire me to learn the craft. Bold black lines confine colors that cry out to be noticed. Your style and subject matter create truly eye popping art. I really didn't know what I was going to make this day and then I noticed the plastic bag just sitting on a chair and realized the opening for the handles would make great eyes! Like many things in the project there was a lot of serendipity involved! I am always impressed by the culinary arts in our submission box. Useally one is not suppose to take a knife to art work, but in this instance it is what suppose to happen. Feeding your bodies as well as our minds, thank you both for submitting your work to us. This week’s offering is a Calendar Page. “Certainty” 18.5" x 8.5" recycled calendar page with charcoal illustration and collage. It was with those words that this week’s C-Rations was begun. Here in America as many are already aware today is “Tax Day” which is the deadline to file our national tax responsibility to the government. By coincidence it it also the anniversary of many notable tragedies. Of course two that quickly come to mind for me are the sinking of the RMS Titanic and death of Abraham Lincoln, but after looking at Wikipedia I found many lesser known tragedies that should also be remembered today. It's no secret that the editors here at Skull-A-Day are big fans in "upcycling" for the good name of skull art. Darin Wiebe over at the Friar Junk blog knows just how fulfilling it can be to turn one man's junk into another man's treasure. I'll let him tell you about this adventure in imagination, "I usually make robots and rayguns out of junk but I tried something a bit different with my latest piece. 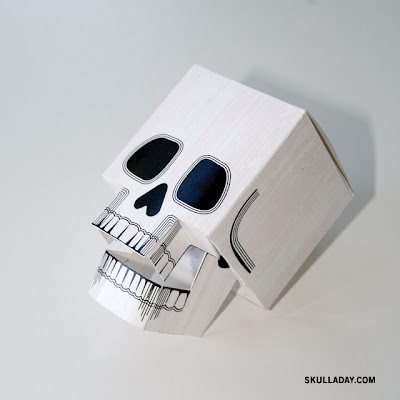 Skulbot is my first wooden robot. 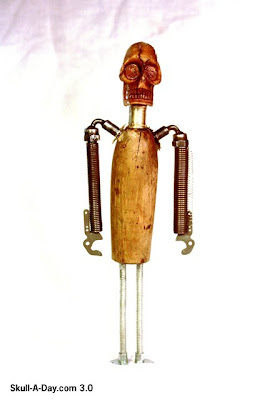 The skull is from a Mardi Gras necklace, his body is a handle from an old awl, arms and hands are from an old typewriter, cogs from an alarm clock, and my favorite parts of him are the old ball and socket joint shoulders - I have no idea what they come from originally." 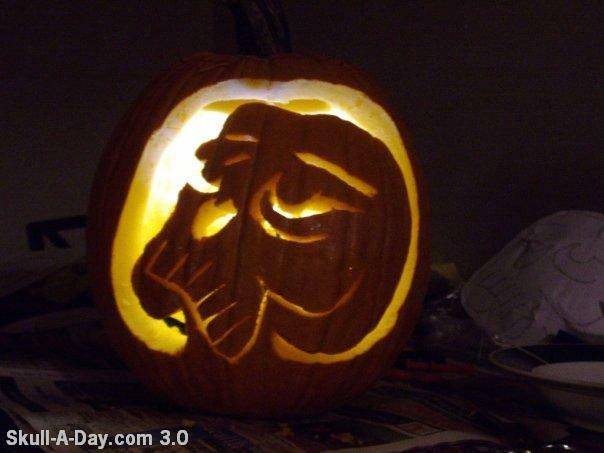 In all fairness, Darin admits that he didn't actually create the skull, but I had to give him credit for such ingenuity. The spare parts look great when given new life. 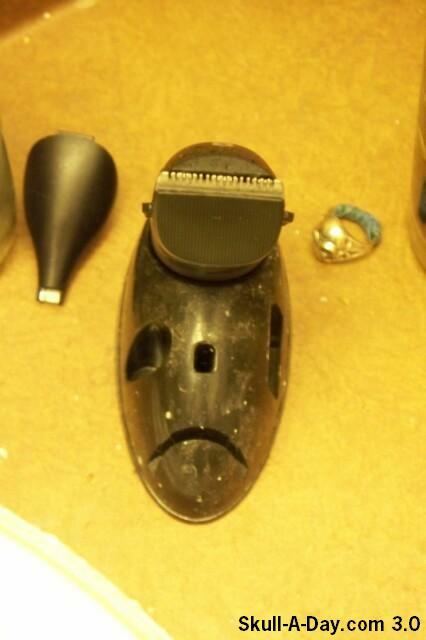 Thanks for sharing, Darin, and thanks for not creating an evil robot hoard to take over the world. Although, they might make good opponents for the zombies. [BONUS] Skull in Use: Quack In The Box! 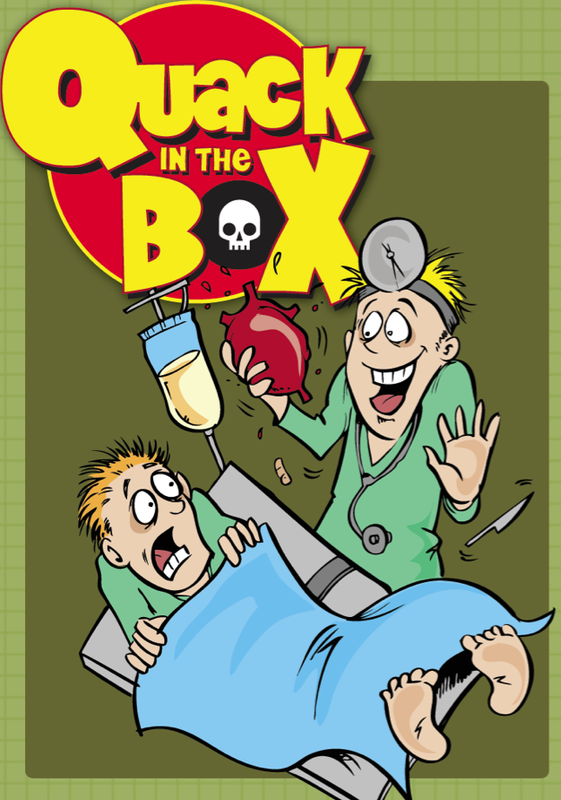 Artist Len Peralta used the skull from my Skullphabet #1 font as part of a design he created for a new card game called Quack In The Box! This is an incredible piece. 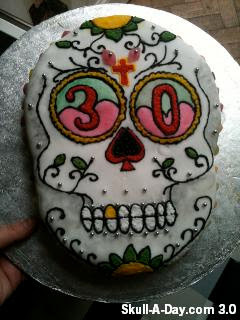 The skill that went into creating it as well as decorating it is unmatched. I appreciate the use of old labels and the use of floral artwork that gives it the appearance of being much older than it actually is. 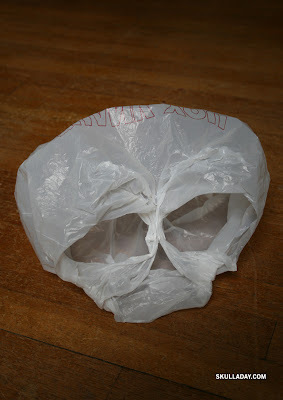 It also brings to mind those public art projects where artists decorate different items to be placed throughout a city. Thank you for sharing your work with us. Take me to it right now. If they don't make posts it's a shame. I hope all of you baseball fans out there can enjoy whatever team your are rooting for this year. 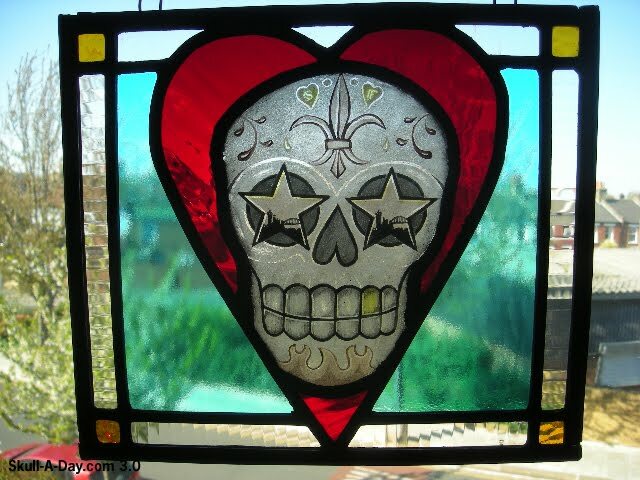 Nick Ilton of Melbourne writes, "Love your site. 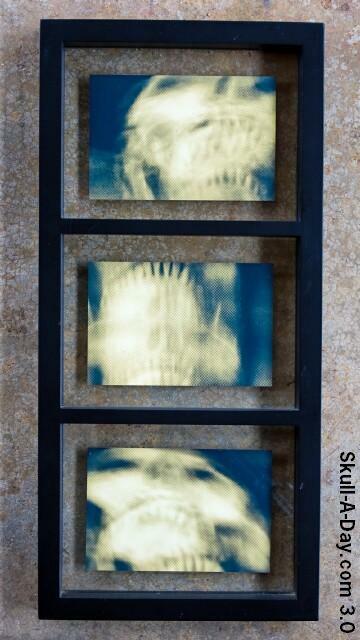 I made this 4ft x 3ft skull a while back and didn't know what to do with it. I decided to give it to the people of Melbourne and bolted it to a pedestrian overpass over a main road. It looked awesome for a few days but was removed after less than a week. Hope you like it." What a great gift, Nick! It's a shame that someone else had to hog all of it for themselves instead of leaving it for the whole city to enjoy. Maybe if someone in the Melbourne area has seen this sign they might be able to get it back to you. 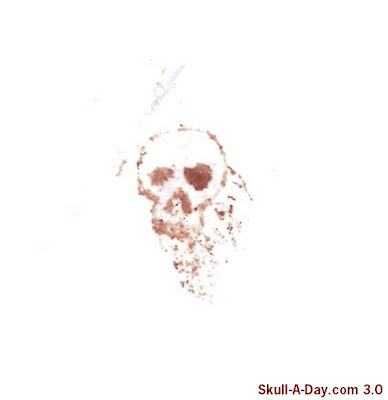 We could start up "Skull-A-Day's Most Wanted" in an attempt to return the stolen property. If not then at least we got to see it in the pic. Thanks for sharing that also.